Among the many images and designs that are found on Satsuma pottery, vases, plates and figures are those of ancient wise men, versed in the arts of knowledge, magic and power. These people are referred to as the Japanese Immortals, men who were of such greatness that they were unable to die, forced to live a life of study, worship and poverty. The Japanese symbol for Immortal 仙人 is made up from 2 other elements meaning "mountain person". Often, the immortal would be a person who had lived in the mountains which were revered by the Japanese as places of magic and awe. The Japanese immortals are depicted frequently on prints and in paintings from early Japan, right up to this day. The 3 gods, Daikoku, Fukurokuju and Ebisu are pictured frequently playing a game of Go. Also deities such as the Seven Gods of Good Fortune or luck were depicted, their promise to the people of the world was of endless riches, wealth and good health. 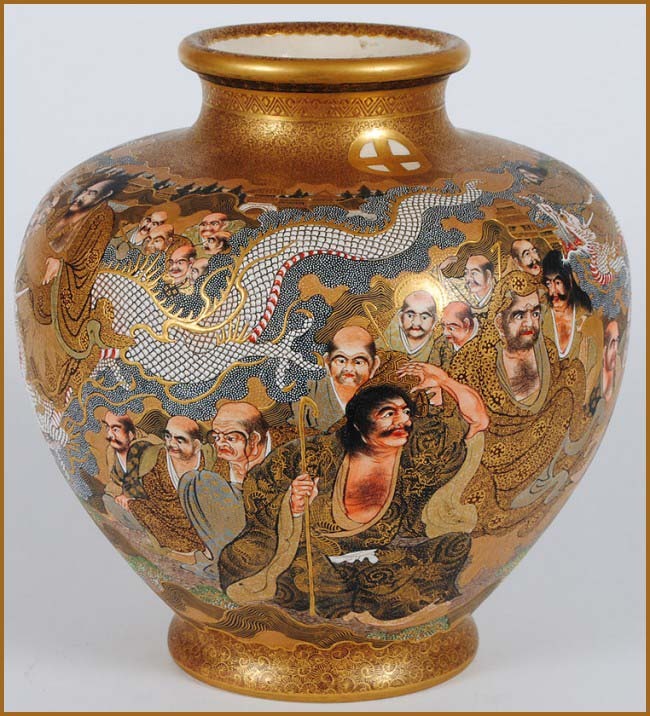 As with other Satsuma pottery, the images of these immortals features on a number of different items. Satsuma Vases are lavished with the images of the immortals either together in a group or often on their own. Although smaller items such as the satsuma buttons were usually decorated with flowers or plants, the faces of the gods were also hand painted on to them with enamel paint. As with most religious or mythical imagery, the satsuma immortals are shown as images that convey good luck, fortune, peace of happiness. They are shown as figures of peace who are fun loving, meditative or at comfort with each other and the rest of the world. Possibly images that were supposed to reflect upon the owners of the satsumaware items. Satsuma ware is something between porcelain and pottery. It is produced at lower temperatures than porcelain. Satsuma ware originates from the seventeenth century. The prince of Satsuma in the Southern area of Kyushu Island had established a kiln with the help of Korean potters. Satsuma ware from this time was made of brown clay. In the late eighteenth century Satsuma was so popular that clay from the Kyushu Island was brought to Awata near Kyoto to produce Satsuma ware - now known as Kyoto Satsuma ware. Most of the Kyoto Satsuma ware was produced for export to Western countries. The characteristics of Satsuma ware are rich decorations with gold and polychrome colors on a soft, ivory-colored, crackled glaze. Typical for the decoration of Satsuma ware is the use of Gosu blue, a highly saturated blue glaze. The technique of Gosu blue was developed in the nineteenth century. with two sculptural boys on sides of Daruma, two boys and an old man, and one boy crawling on top of Daruma's head. 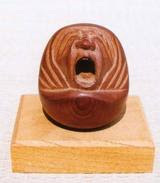 The Okimono has a traditional Satsuma craquelure. 5 1/2" tall x 6 1/4" wide x 5" deep. The ancient Japanese province of Satsuma was in the southern most part of the island of Kyushu. Its association with the production of pottery and earthenware was well known by the early 17th century. It was at this time that master artisans from Korea were introduced following a series of invasions by Japan of Korea and the impress of artists into service for the Satsuma Shogunate. This "freshette" of talent was applied to the simple but beautiful vessels for the tea ceremony and subsequently grew in fame throughout Japan's aristocracy. Most of the early Satsuma was simply made and featured a cream colored body with a slightly yellowish glaze that was finely crackled, a hallmark of collectible Satsuma to this day. Highly prized among the noble houses in Japan these fine wares were noticed by the earliest western visitors to Japan. By the end of the 18th century, Satsuma production had not included porcelains, and was restricted to the local clays and earthenware of the Chawan (tea bowl). However, in neighboring Arita potters had been making finely enameled porcelain wares for many years, primarily for export. In an effort to be more competitive Satsuma missions were formed to scour Japan for techniques of decorating Satsuma ware. It was in Kyoto where these missions were introduced to the enamel colors that had been in use for over a hundred years. These techniques were brought back to Satsuma and revolutionized their wares. By the same token, Kyoto studios began to produce fine, artistic "Satsuma" ware.
. . . CLICK here for Photos and English information !
. Satsuma, Kagoshima Folk Art .